BURRILLVILLE, R.I. — Since last October, Jess Belhumeur and Dan Sullivan have been living the American dream. They built it themselves. It’s much smaller than the prototype, it doesn't have a white picket fence and it's on two wheels. In fact, it’s not much bigger than the backyard shed of a typical American home, but you won’t find a lawn mower or hedge trimmers inside. A rabbit named Wendy, however, does call this place home, but she was invited. The average size of new single-family homes in the United States increased from 1,780 square feet in 1978 to 2,479 square feet in 2007, despite a decrease in the size of the average family. Today, the typical American home is about 2,600 square feet. Dan and Jess live in a space that is a fraction of that size. Their decision to go small was largely based on the couple's desire to reduce their carbon footprint. It also was about money. They downsized from a 600-square-foot apartment in Woonsocket to the backyard of Jess’ dad, where they built their new home by hand. The young couple — they are planning an October wedding — realized they didn’t need or want a big, or even a medium-sized, house to collect, as the late comedy great George Carlin would say, stuff. Instead, they thought small and embraced the tiny house movement — a recent shift from McMansion-sized expectations to portable dreams. Tiny houses range from 80 to 220 square feet. Jess and Dan’s is 156 square feet, including the loft where they sleep. The bedroom is a loft space above the kitchen. Built-in storage above the bed maximizes the use of space.Like many in the movement, they built their tiny house on a flatbed trailer, so it can easily be moved. A wheeled foundation also avoids layers of bureaucracy, because from a zoning standpoint their home isn’t considered a structure. There’s also the financial savings that come with downsizing. Dan and Jess have no monthly mortgage or rent payment — they just had to register the 16-foot-long trailer and keep its plates current. The couple designed the home themselves, and they built about 30 percent of it with reclaimed, reused and recycled materials. For example, they drove three hours to New Hampshire to pick through garbage bags filled with pink insulation, occasionally disturbing the home of a family of mice. For the cost of $72, not including time and gas, they returned to Rhode Island with 18 bags of insulation. Another trip to New Hampshire proved much more fruitful. They bought reclaimed wood from a barn built in 1776, with the idea of using it for their new home’s flooring. But after removing the nails and planing the wood, they decided to use the old barn board for the ceiling. It’s the tiny home’s signature attraction. “The ceiling is awesome,” Dan said with pride. He’s right. 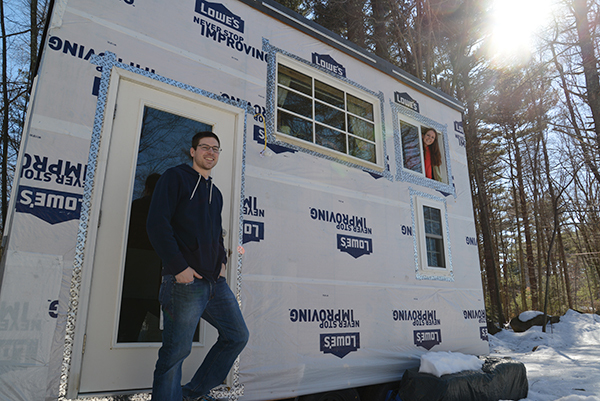 In fact, to the two ecoRI News staffers who visited on a recent Sunday afternoon, the tiny home is wicked awesome. It cost Jess and Dan $10,000 to build — no professionals were hired and it took a year of weekends to finish. They estimate they saved $7,000 by using secondhand materials. Friends, family and neighbors provided advice and tools. Some also supplied their share of eye rolls, and a few have affectionately called Jess and Dan “nut jobs.” A group of 25 people helped Jess and Dan raise their home’s walls. Their tiny home is 8 feet wide and 10 feet high, and the floors are made of bamboo. The leftover barn board was used to build a small desk. All of the wood, including the pieces found in the backyard woods and used to create the three-step ladder to the loft, among other things, were treated with tung oil. For color, milk paint was used. No harsh chemicals are used to protect or clean. A 400-watt Eco-Heater heats objects inside the home instead of the air. During the recent ecoRI News visit it was 37 degrees outside and a cozy 65 inside. There is no running water. All water is carried in and out in one of eight 3.5-gallon plastic water bricks. Dishes are washed in the kitchen sink, which is nothing more than a removable metal bin. The water is heated on a small gas stove. The couple takes camp showers — a bag of water is hung in the sun for three hours. You stand in a metal tub and the gravity-fed bag releases the solar-heated water. These showers aren’t meant to be long. The home’s toilet is of the compost variety. Basically, it’s a 5-gallon bucket, and after you are finished, you cover your deposit with a handful of sawdust. The planing of the barn boards produced two month’s worth of sawdust, and now Jess and Dan buy pine shavings that are common at most pet stores. The waste is composted in an enclosed system behind their home. To educate themselves about composting toilets and to make sure they didn’t offend Jess’ dad and his neighbors, they read “The Humanure Handbook: A Guide to Composting Human Manure” by Joseph Jenkins. So far, there have been no neighborhood complaints, just looks of disgust or confusion. Since their small, electric cooler holds little, they take advantage of their home’s coldest areas, along the two wheel wells, to store food. They also have learned that a lot of food doesn’t actually need to be refrigerated. They created a blog to document their experience. This spring, Jess and Dan are working on moving their tiny home to a Rhode Island farm, with hopes of living off the grid. They currently are plugged into Jess’ father’s home, but they have ordered solar panels, and they are designing a system to catch rain. They are looking for a year lease, and are willing to simply pay rent, work the farm in exchange for rent, or a combination of both. The cozy confines of their tiny home suit them — and they plan to live in it for at least another year — but they do have visions of something bigger and better, say, a 700-square-foot sustainable homestead. They envision this future homestead will have organic gardens, composting, grey-water and rain-water systems, chickens, fruit trees and solar panels. Perhaps even an outside kitchen, but they recognize that’s California dreamin’ on a winter’s day.